Between the pain in the neck crap I had to deal with at work, the horrendous traffic I endured doing an errand for the beloved boyfriend and the torrental downpour I ran through because I forgot my umbrella I had this excited anticipation and calm because I was going to blog about Glee today. It’s the little things that will calm you down when traffic is going 25mph on a major state highway. Or when it takes you 45 minutes to get from point A to point B when normally it takes 10. I even canceled a dinner tonight with an old friend because I though, "geeze, I wouldn’t even want to be in the same room as me right now." But then I arrived home, all tired all dishelved and there she was just sitting on the couch waiting for me to photograph her. 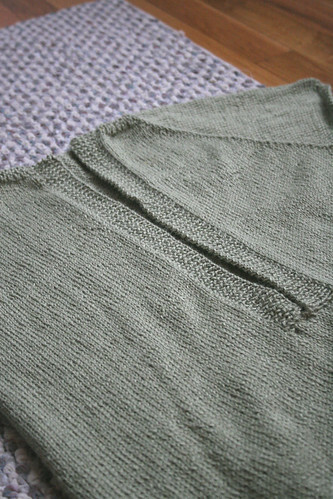 This beautiful, simple, and so is going-to-be-worn-a-hundered-times top was a quick and satisfying knit. The title of which is the emotion I am hoping to get to after several glasses of red wine and a foot massage. I cannot recommend enough this pattern. It’s simple but oh so satisfying. I have yet to buy and or sew on the hook and eyes. I went this weekend to one craft store admid errands and all they had were black ones. I am off tomorrow (The small perks of working at a Catholic HS: holy days) and will most defintiely be visiting some shops for them. And in case you were wondering in suspense what I went ahead and did with dear Fifi. She and I had a nice heart to heart over some Veuve Cliquot. We’re getting along famously now. Veuve Cliquot has a way of taking the pain of the day away, doesn’t it? Your Glee is so beautiful, I almost say to forgo the clasps and all that and wear it as is…and Fifi looks very promising! I agree with Heather – it looks so great as it is – I wouldn’t do the clasps either. Great work! Looks wonderful on you! And fifi is very promising looking. Enjoy your day off, too. that looks wonderful – do you really need the hook and eyes? I like it kind of open at the neck…. I think it looks fantastic, I don’t think you need anything extra on it at all. Glee is awesome! 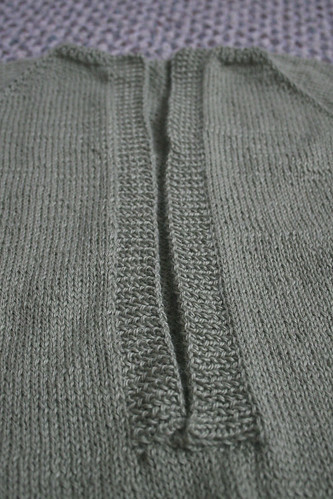 I love that you knit it in a nice neutral color–you will be able to wear it lots and lots. Great job. That top look just fantastic! I definitely have had a thought or two about Glee, and you’re making it very hard to ignore. Just beautiful! I love it the way it is. Beautiful job. The book is good isn’t it? Looking forward to chatting about it! And you’ve been tagged..(if you haven’t been already).. rules are on my blog. Glee is beautiful, especially in that color. Glee looks fabulous….I love the color! I like the open glee, too! 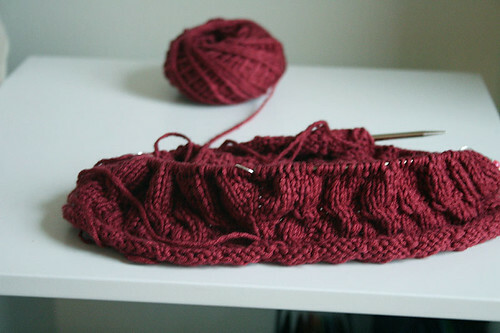 Can’t wait to see your Fifi in progress, I’ve been considering knitting that pattern, too.